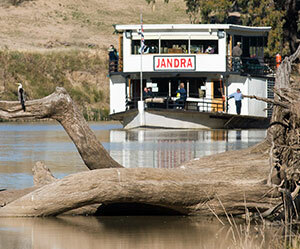 Located on the Darling River near Menindee, Kinchega National Park covers a large area incorporating several of the Menindee Lakes (originally named the Laidley Ponds) and some of the best vantage points for fishing and camping along the banks of the Darling River. The magnificent, and much photographed Kinchega Woolshed is also located within the park and is situated near the National Park Office. 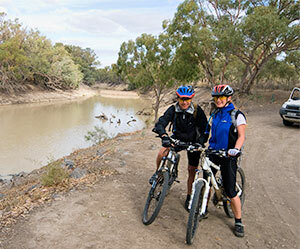 With the magnificent Darling River forming its eastern border, Kinchega National Park was formerly part of the Kinchega-Kars pastoral lease which covered 800,000 hectares and extended all the way from Menindee to Broken Hill. The area of Kinchega incorporates half the lakes which makes up Menindee Lakes; man-made lakes (originally pondages of the Darling River) feed by the seasonal flow of the Darling River. 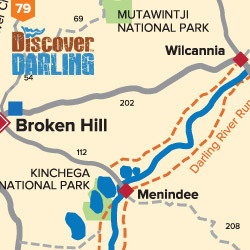 Some of the most iconic Darling River vistas can be viewed at Kinchega and the banks provide idyllic camping sites with abundant birdlife and wonderful fishing spots. Kinchega shearing shed is in remarkable condition and is a great insight to a bygone era with many preserved examples of equipment and machinery. As part of the handover ceremony in 1967, the last sheep was shorn and that took the total to 6 million over the life of the station. 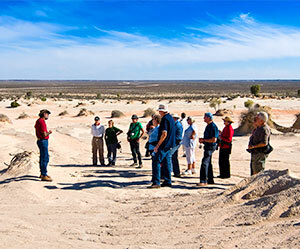 As it is part of the Menindee Lakes and the Darling River, the area has an abundance of remnants of Aboriginal occupation including settlement sites, middens and ceremonial sites and scarred trees. 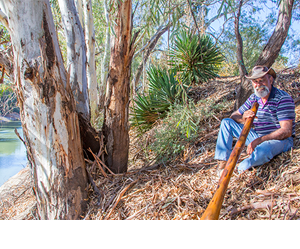 It was often a meeting place of the Barkintji people (the people of the Darling River) and Wiljakali people traditionally of the Broken Hill area.